Make this unique and meaningful centerpiece with letters covered in burlap. This centerpiece pattern will show you how to use letters purchased at a craft store and give them a distress look using acrylic paint. The letters are then covered in antique white burlap. 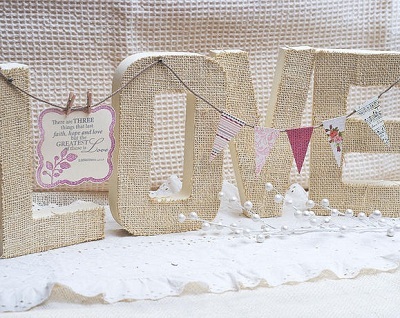 Twine is draped across the letters and sweet little messages, decor or both are applied to the twine. The word in this project is "love" but you can use different letters for a centerpiece for a baby shower, birthday party or anniversary. Have fun making a centerpiece that will be remembered and appreciated by love ones.